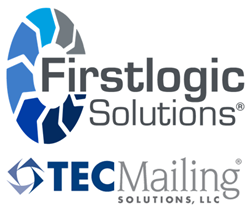 We’re excited to be growing our relationship with our friends at TEC Mailing from Firstlogic DQ9 customer to Firstlogic DQ9 SaaS hosting partner extending these new “In-Cloud” services to our “On-Premise” customers. Firstlogic Solutions, a leading provider of address cleansing, data quality and presorting solutions has announced a Premier “In-Cloud” Partner agreement with TEC Mailing Solutions, the industry’s premier Software as a Service (SaaS) provider. This new “In-Cloud” agreement delivers Firstlogic® DQ9 ACE® address cleansing, Match/Consolidate® de-duplication and Presort IQ™ presorting to Firstlogic Solutions’ customers. The new “In-Cloud” services will be introduced next week at the Firstlogic Solutions booth #2072 at Graph Expo 2015 in Chicago, IL. “The Firstlogic® DQ9 “In-Cloud” services provide customers with additional processing capabilities to augment their current “On-Premise” capabilities to include Firstlogic ACE® for USPS®, CASS™, NCOALink® 18/48 month and DSF2® address cleansing, Match/Consolidate® for duplicate record detection and Presort IQ™ for USPS PAVE™ Gold certified presorting to achieve the highest discount rates,” said Alex Kucera, Director of Solutions Sales. “These new service options provide a much more cost effective approach compared to the costs to acquire the licensing required to run these services on-premise,” says Kucera. “For close to a decade, TEC Mailing has provided Software as a Service (SaaS) solutions based on the original Firstlogic Postalsoft ACE, DataRight IQ and Match/Consolidate products,” said Brian Euclide, President of TEC Mailing Solutions. “We were thrilled to learn that Firstlogic Solutions took over development and support of the SAP Postalsoft DQ 8.0 platform that reached end of life on March 31, 2015. Now we can continue to offer the same robust and proven solutions to our partners including Firstlogic Solutions and their customers,” says Euclide. “We’re excited to be growing our relationship with our friends at TEC Mailing from Firstlogic DQ9 customer to Firstlogic DQ9 SaaS hosting partner extending these new “In-Cloud” services to our “On-Premise” customers,” said Ken Kucera, Managing Principal at Firstlogic Solutions. “This Win-Win-Win relationship brings greater value to our customers by delivering simple and cost effective address cleansing, data quality and presorting solutions based on their specific needs,” says Kucera. To learn more about the Firstlogic Data Quality (DQ) products and services, please call 1-888-725-7800 or visit the website. Overview documents for Firstlogic data quality products are available in the Resources section on the webpage. Firstlogic Solutions, LLC is the leading SAP Gold Partner specializing in the SAP Data Services (DS) and Firstlogic Data Quality (DQ) software and services solutions. The Company delivers both “On-Premise” and “In-Cloud” address and data quality solutions including data profiling & monitoring, address cleansing & geocoding, data cleansing & standardization, data matching & consolidation, data enhancement and postal presorting. Customers include both large enterprises and midsize companies from across all industries in North America. TEC Mailing Solutions, LLC is a Software as a Service (SaaS) provider of name, address hygiene and mail sortation services for web-to-print, CRM, ERP, and variable digital printing solutions. TEC's services are consumed as embedded functions in applications to improve workflow or standalone web portals available through a network of partners. Privately held, the corporate office is located in Sun Prairie, WI. Presort IQ is a trademark and Firstlogic, Firstlogic Solutions, ACE, DataRight IQ and Match/Consolidate are registered trademarks of Firstlogic Solutions, LLC. CASS and PAVE are trademarks and USPS, NCOALink and DSF2 are registered trademarks of the United States Postal Service.